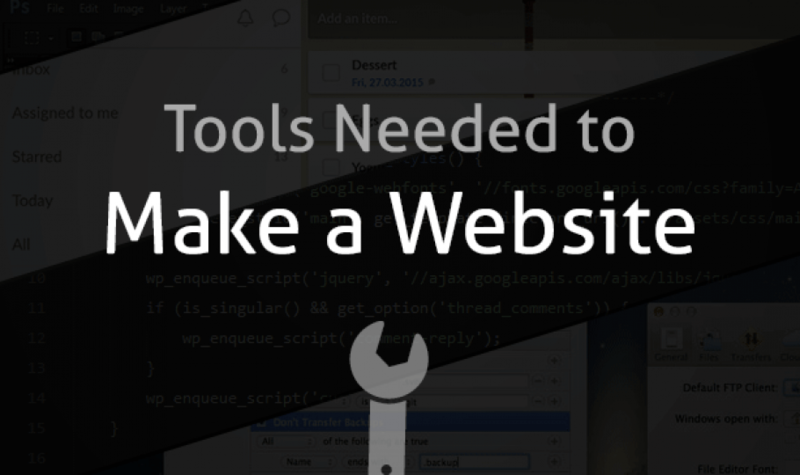 To make a website, you’re going to need a few specific pieces of software. I’ve put together this comprehensive overview of the exact tools you need to get going on the right foot. Most of these are especially relevant if you’re just starting out and aren’t sure what you need. Everything from design tools to task management and coding is covered because all projects, some are small yet others require a full toolset. If you’ve just started diving into web design and development, but are still at the beginning stages, this is the perfect list for you. With all the tools you need to make a website and get it online, you’ll be cranking out sites in no time. Why use it? : A design tool is what you use to get the basic idea of the website going. You won’t be adding any functionality here, just tweaking the look and feel to get it right. Developing the actual site is more time-consuming, so it makes sense to work on the way it looks first. Photoshop is the oldest and most well-known design tools on the market. In addition to it being an incredibly powerful piece of image editing software, it’s got all the functionality you need for web design. If you’re looking for the most premium design tool, check this one out. Sketch is the new kid on the block, but although it’s not been around as long as Photoshop, it definitely has enough functionality to be a serious rival. If you looking for a dedicated web design tool, Sketch is your best bet. GIMP is a free alternative to the two above. It’s not as powerful as Photoshop or Sketch, but has a huge suite of tools that make it a staple in the careers of many. Why use it? : While it’s true that you can use a basic text editor like Notepad on Windows or TextEdit on Mac, those tools lack the advanced functionality that can seriously speed up development time. Functionality like code completion, where code is automatically finished for you and error checking, where the editor lets you know if there are any problems with your code. Before there was Sublime Text, there was Coda. With a whole host of plugins, themes and solid features, Coda is a great editor, as a result it’s definitely worth a try. It’s the newest of these three, but don’t let that stop you from giving it a go. Brackets has a whole host of features that rival both Sublime Text and Coda, such as live preview and preprocessor support. Why use it? : A task management system allows you to easily create, edit and track tasks, which can increase the amount of work you get done. By being able to see what needs doing as soon as you sit down and have everything organised, you’ll get a lot more done in a shorter amount of time. It won’t speed up how fast you do the work, but it will increase how much you get done every day. I use Wunderlist every day and can highly recommend it as being the best to-do list on the market. It has some great features such as comments, file uploads and sub-tasks. Asana is a more fully fledged task management app than Wunderlist. It has a calendar view, which makes working on larger projects much easier. Trello is a different take on task management and uses a card system, instead of the traditional checklist. That being said, a great feature you can use is checklists inside the cards, along with assigning to others and file uploads. Why use it? : An FTP program is simply a piece of software that connects to your web host, so you can easily upload your website to it. There are loads out there, but the two below are the best and easiest to use. FileZilla a great solution for FTP if you’re a Windows user. Incredibly reliable with a whole host of features and functionality, such as support for FTP/SSL/SSH, filename filters and a load more. Transmit is a really powerful, Mac only solution to FTP. Furthermore It’s got a two-panel view, bandwidth limiting and a load more. A great solution for Mac users. Although there are countless options out there when it comes to the tools you need to make a website, the ones above are essential. In conclusion, I highly recommend checking out all the recommendations above and seeing what works for you. I’ve tried hundreds, probably thousands, of tools since I started making websites over seven years ago, and I’m always looking for the next best thing. Keep trying new things until you find something that feels just right, because at the end of the day, these tools will have a huge impact on your work, so it’s worth your time to thoroughly test them out. Great post, but was hoping to find also some “testing” software options. Where can you see if the website look the same on every device, browser? Very great post. I simply stumbled upon your weblog and wanted to say that I’ve really enjoyed surfing around your weblog posts.